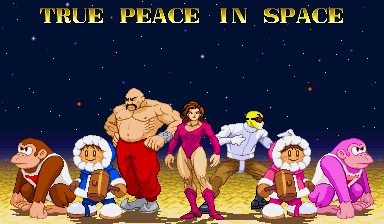 It’s finally that day in November when we remember the brave cyborgs of the past (or future who came into the past, thus becoming part of the past) who sacrificed so that Christmas could come to be! New sprites of Kunoichi and Ninja from Ninja Warriors Again (Natsume’s re-imagining of Taito’s Ninja Warriors for the Super Famicom/Super Nintendo) have been added to the Taito Custom Sprites gallery and fighter-sized GFX Generator. 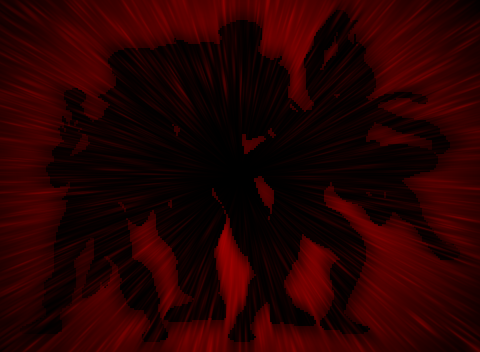 They join Kamaitachi from last year’s Cyber Week updates to fill out that playable roster. I made a few improvements to his sprite, mainly the shoulder pad. 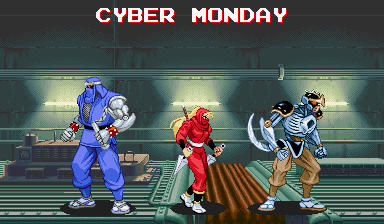 What’s Cyber Monday without a little pushing of merchandise? Don’t worry, this site has that covered… kinda. 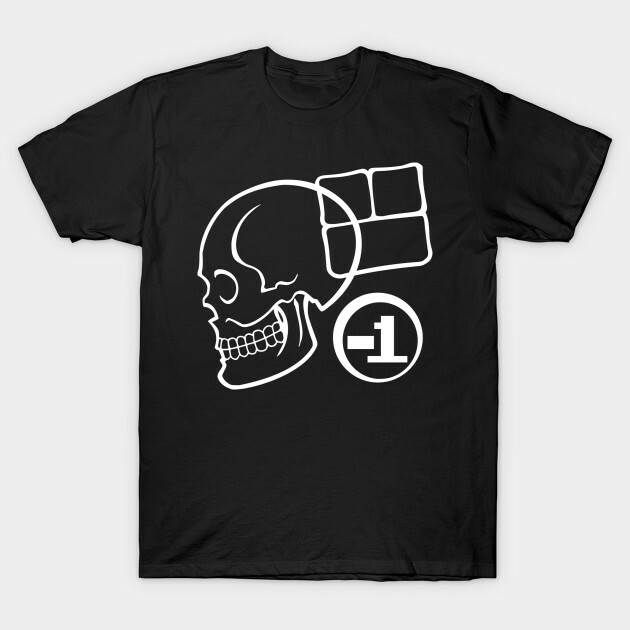 TeePublic marked their T-Shirts down to $14 a pop, so that means the shirt with the Minus World section’s logo is $14 for today only! What’s the Minus World section? It’s one of the oldest parts of the site, going all the way back to the days when the site was hosted on Angelfire. That spot seems a little dormant right now, but, now that the big, lingering GFX Generator project is done, it may be time for to start revisiting some of the neglected areas of the site. Illmosis / ScrollBoss prints sale! 8×10 and 8×11 prints are $5.00 each! 11 x 17 and 11 x14 prints $8.00 each! The prints are on the Shop page here and more non-game art on the Illmosis prints page in this link! edit: I’m adding a small incentive to this, starting now. I just realized I have a few secret sprites for next year’s projects that just happen to have Black as part of the character name. So I made one more sprite and came up with an idea. There are five sprites in that screenshot up there. For every print that sells before Monday, I’ll unlock one of those sprites in the custom sprite galleries and main GFX Generator. If anyone buys, I’ll make a fake hi-score screen with with the buyer’s 3-letter initials and display name of their choice and scores based on the number of prints bought. 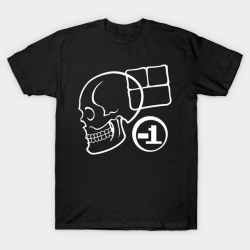 I know it’s not much, but it’d be my way of thanking you for buying something. If nothing is bought, those sprites will stay in the vault until their projects are done (next year or later). Whether you buy or don’t buy, I hope you’re having a good weekend! The new sprites and logos have been added to the new fighter scale GFX Generator. That generator also got the gold 16×16 font from Fighter’s History Dynamite/Karnov’s Revenge and the “Mego WGSH 176×192” got a new set of Data East portrait bubbles! As a celebrator of Karnovember, it’s my duty to send you a link to the Karnovember Tumblr tag, because that’s where I first heard about it. I’ll be doing my part to add content to that tag soon. 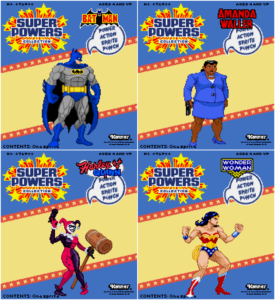 Gaming Hell just added a page about Namco’s Numan Athletics and Mach Breakers, their super-powered sports games. There’s some really cool info in there, including a few things to prove that the games are linked! There will be new scratch-made Samus sprites in the next update, possibly this week or weekend. 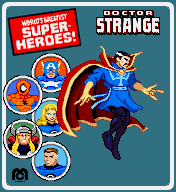 Hey, look, it’s a sprite of Doctor Strange! Why, his movie just came out this week! That sprite is based on his Ultimate Marvel vs. Capcom 3 fight stance and everything! Even converted two of his classics logos into mini-logos! 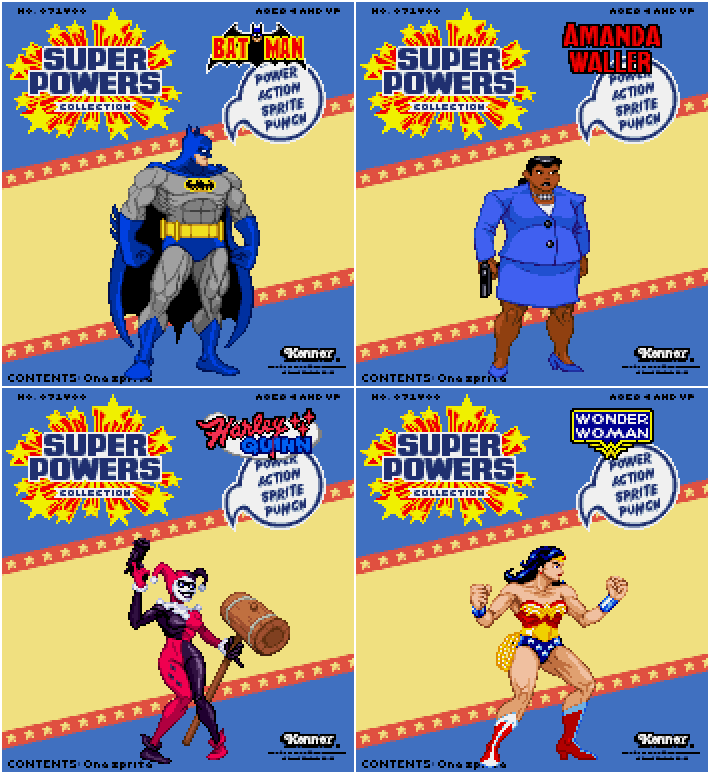 They’ve been added to the new GFX Generator, which is still one surfer short of an old-school Defenders line-up! That’s all I’ve got this time! Sorry, I’m still dry as **** after the DangerTerrorHorrorThon, which wasn’t even a week ago. Don’t worry, I’m going to re-hydrate with two bottles of Arizona Iced Tea this weekend before getting back into the game. 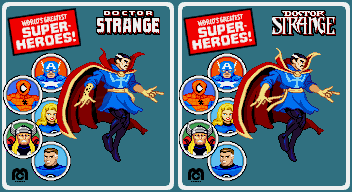 edit 2016-11-05: Already drank one bottle of Arizona, so I’ve got enough power to make some fixes to the Doctor Strange sprite, along with making a more comic-accurate version.